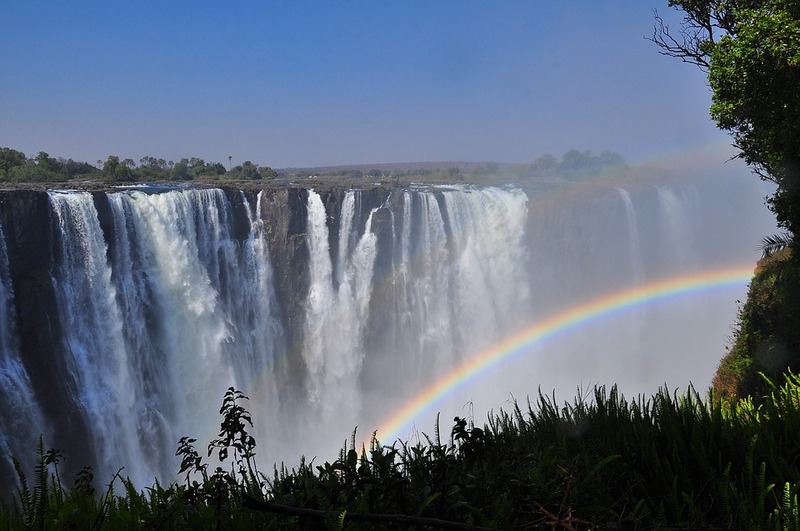 The Victoria Falls topples over a sheer 100 metre (330 feet) drop. It forms a mile-wide (1,609 metre) curtain of water that is as spectacular as its reputation and more! It can be viewed from numerous viewpoints. Victoria Falls is said to be the largest fall in the world. It is also one of the furthermost attractions in Africa and most impressive waterfalls in the world. The noise of this falls can be heard from a distance of 40 kilometers. Its mist and columns of spray from the falling water is escalating over 400 meters and cab be seen from a measurement of approximately 50 kilometers. It is the widest curtain of falling water in the world, and during the months of February to April (after the rainy season), the volume of water cascades at over 500 000 cubic metres per second into the gorge below. This results into a spray that can be seen from more than 30km (20 miles) away and from there it derives its local African name – Mosi-Oa-Tunya – ‘The Smoke that Thunders’. The Victoria Falls are fed by the steadily flowing Zambezi River that originates in the mountain regions between Angola and Zambia. This river reaches the Indian Ocean in Mozambique. The Zambezi River is 1,687 miles long (2,700 km) and is Africa’s fourth largest river. The best time to visit the place is during dry winter period from months of June to August. You may witness the great game viewing, warm days and cool nights, little to no rain and abundance of water still rumbling on top of the cliff during this season. You are likely to experience many activities this season thus, considering it is vital. Visiting the falls can be a receptive overload as the noise, heat, and moisture come together in a remarkable and genuine strikingly attractive.